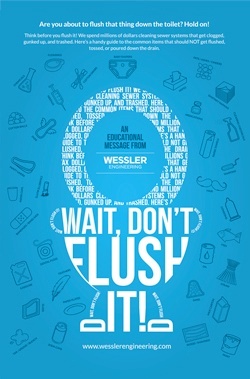 Free Poster: WAIT, DON’T FLUSH IT! Are you about to flush that thing down the toilet? Hold on! Think before you flush it! We spend millions of dollars cleaning sewer systems that get clogged, gunked up, and trashed. Here’s a handy guide to the common items that should NOT get flushed, tossed, or poured down the drain. Help spread the word with an educational poster from Wessler Engineering. Hang it in your office restroom or your public facilities. Download this high-quality poster when you complete the form on the right.